Every year, we say we're going to head to the Fall Festival at Hindinger Farm and every year, we somehow don't make it. Well, not this year! 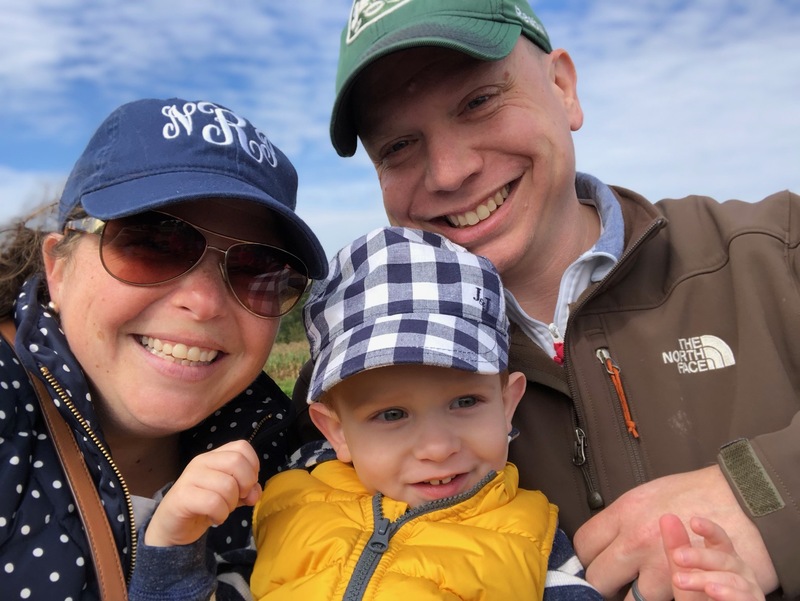 We have actually been getting our weekly CSA from their farm for a few years now and their produce is incredible but what we love even more is the family-run business and warm, welcoming atmosphere they have each and every day. Their Fall Festival is no joke! There is SO MUCH to do for the entire family! 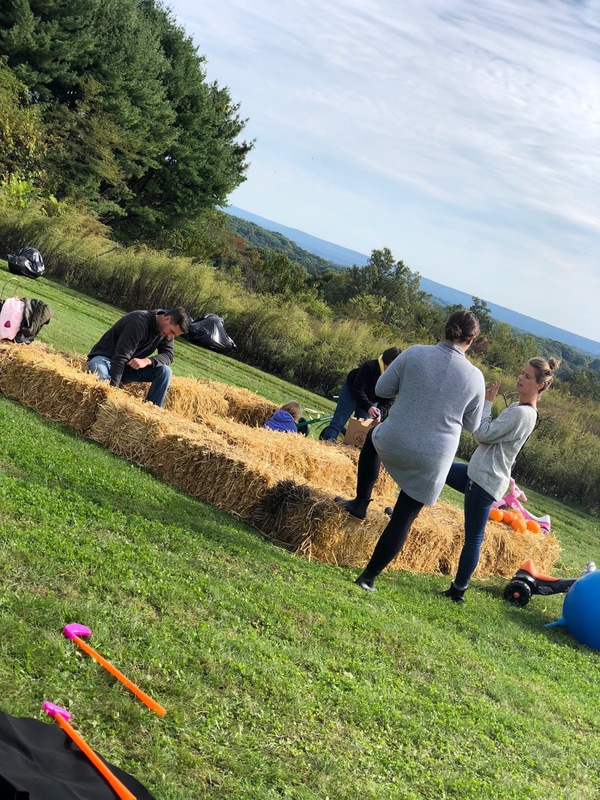 On top of what is always at their farm on a daily basis for kids to do, they add a plethora of activities, games, and more for this event! They had an adorable photo booth area set up for families to take pictures, as well as an actual photo booth was there with props and all. 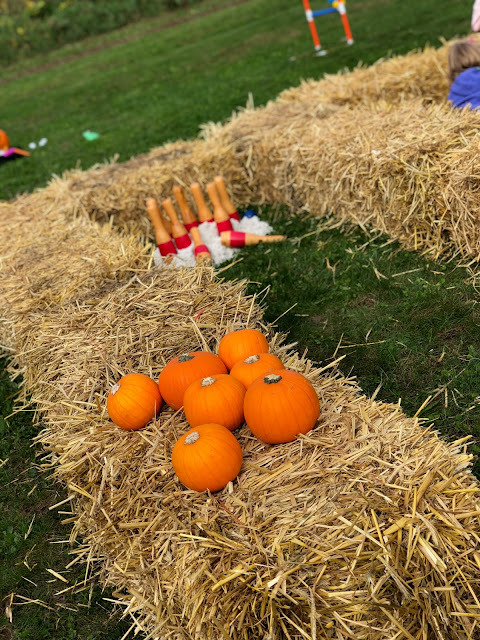 We really enjoyed the authenticity of this one with the bales of hay, Indian corn, pumpkins, and more. 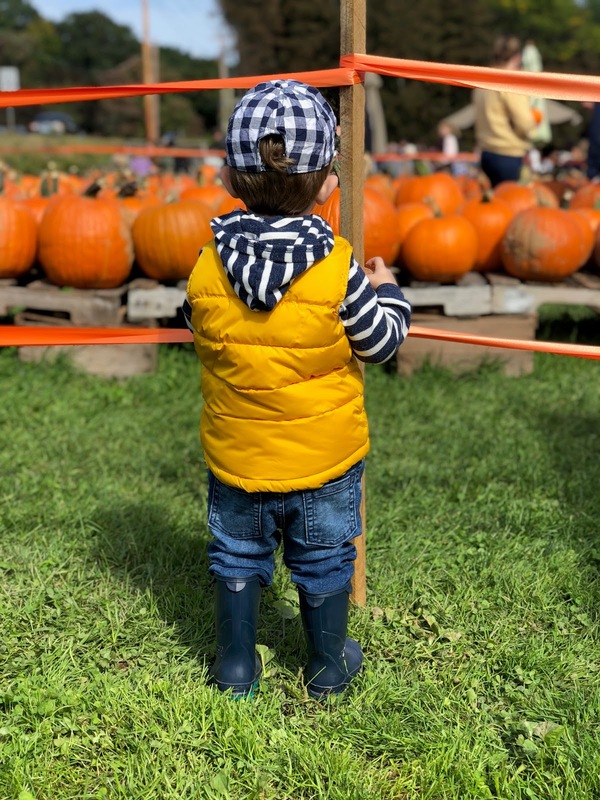 Their pumpkin patch was well-stocked and had a variety of sizes of pumpkins to choose from plus they had a BIG assortment of mini-pumpkins and gourds for those who want to be extra creative when decorating their front porches! They always have this amazing wood train play area at the farm that kids (and adults) can play on every day. But today it was jam-packed with tons of families having a blast, including our little one who just kept following all of the big kids! 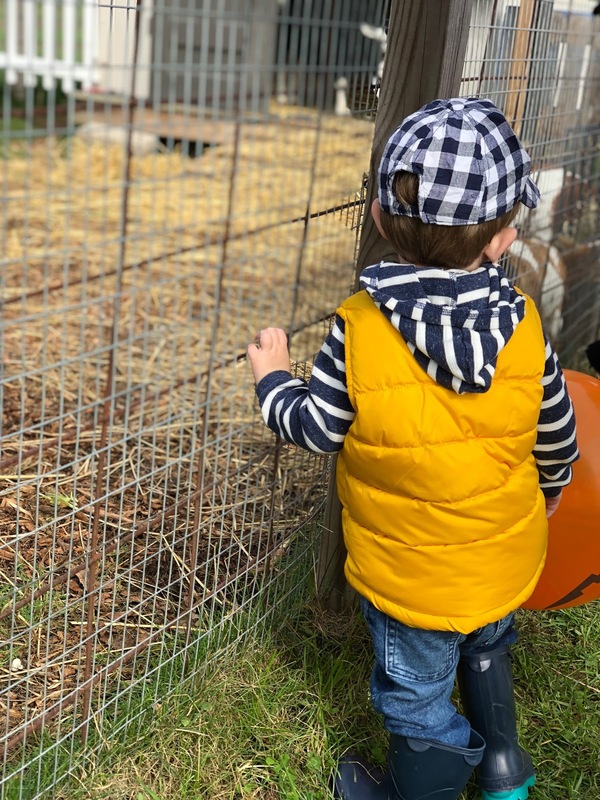 They have this incredible fenced-in animal farm where the kids can come and visit and watch the animals in their natural state. 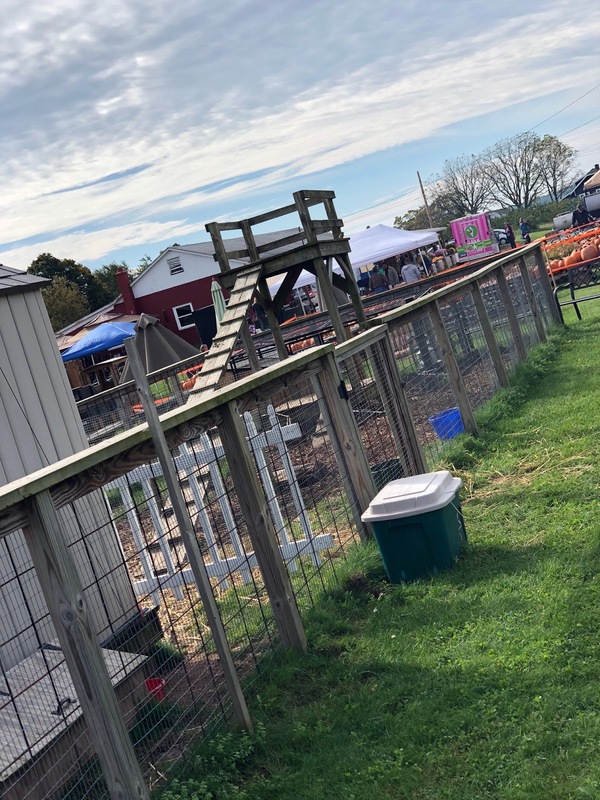 They have chickens and lots of goats of all ages and varieties. Today, the kids really enjoyed the rare opportunity to watch them get fed! Talk about creative! Inside these bales of hay were bowling pins and balls (or baby pumpkins) and the families could bowl! And what was super smart on their part was the sand under the pins to keep them from falling over from the wind. 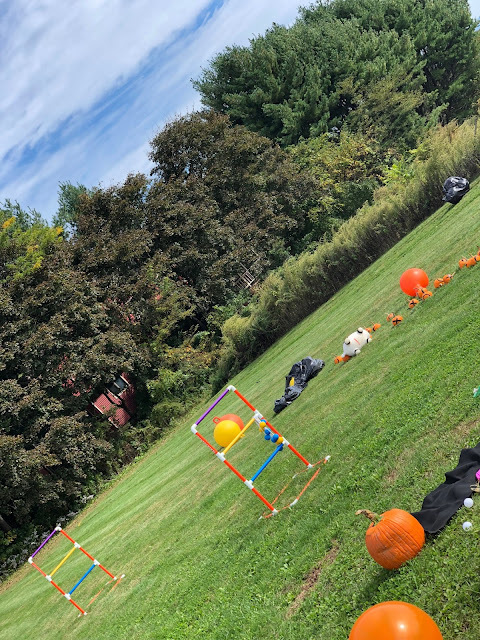 All kinds of activities were set up for families to enjoy. Ladderball was one of many! 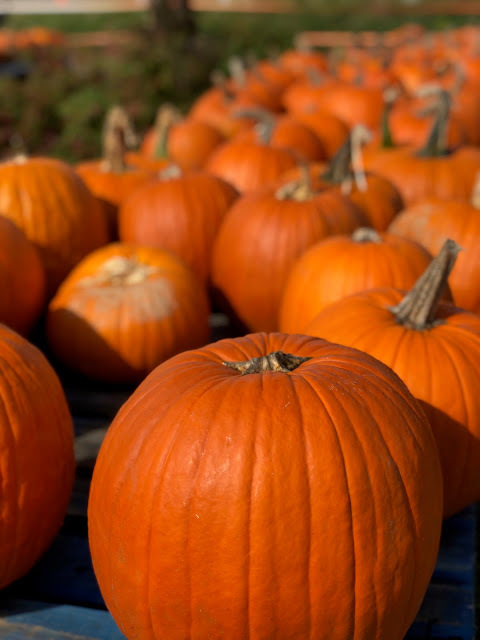 How bout those pumpkins?! 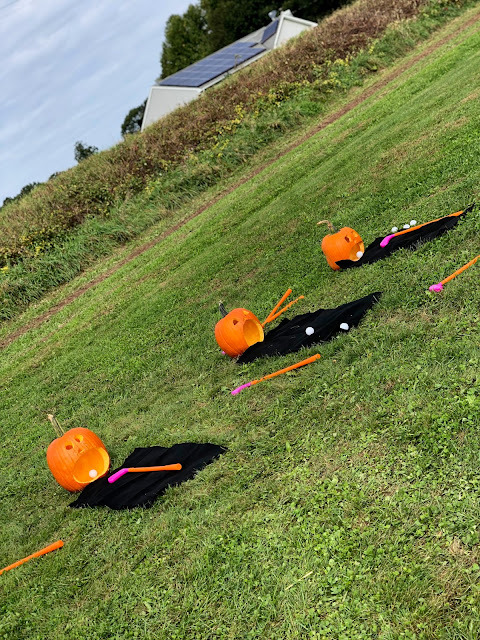 They carved the pumpkins so kids could "golf" and aim for inside the pumpkin head! The ring toss was fun for our little guy. 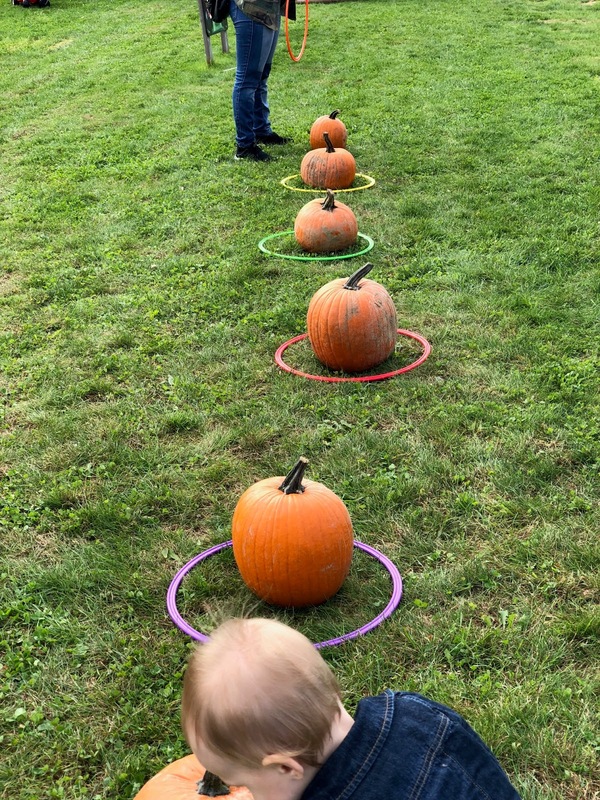 He had a blast trying to get the hoops onto each pumpkin. I'll admit- this one was hard! 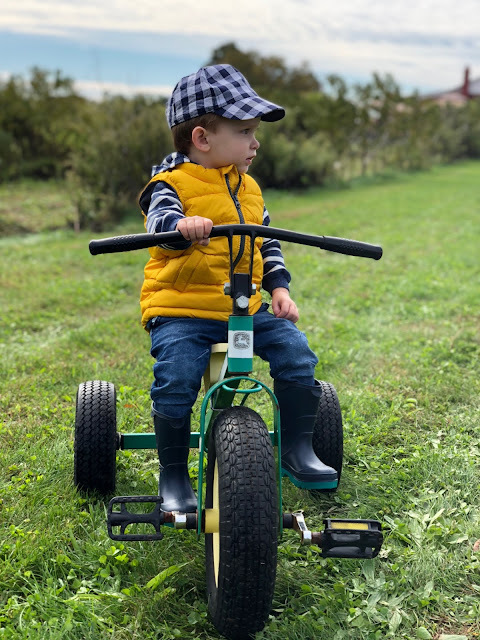 They have a collection of kids toys and bicycles at the farm every day. But they brought out some extra special ones today. This one was a HUGE hit with Ness - we even googled it to see if we could get one for our house! 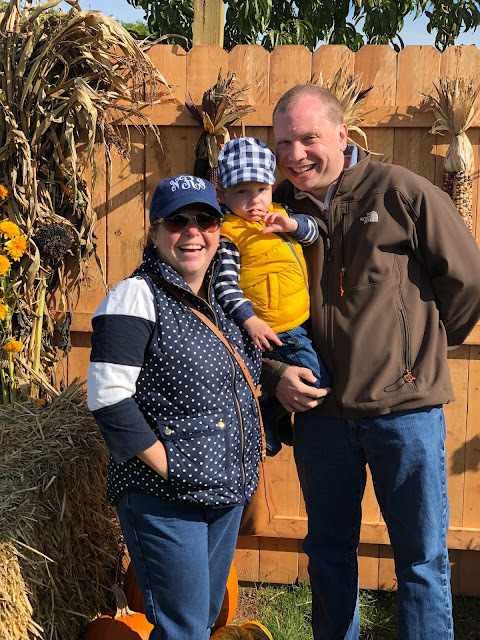 Is it a true fall festival without a hayride?! 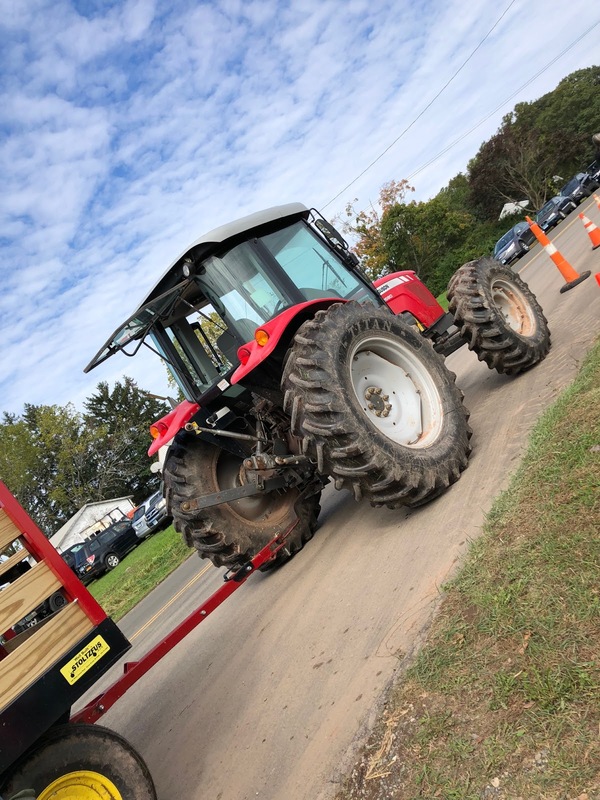 Well, even though there wasn't any actual hay on our hay ride, there was a giant tractor pulling us so we'll call it a hay ride. And if you don't selfie, did it really happen?! 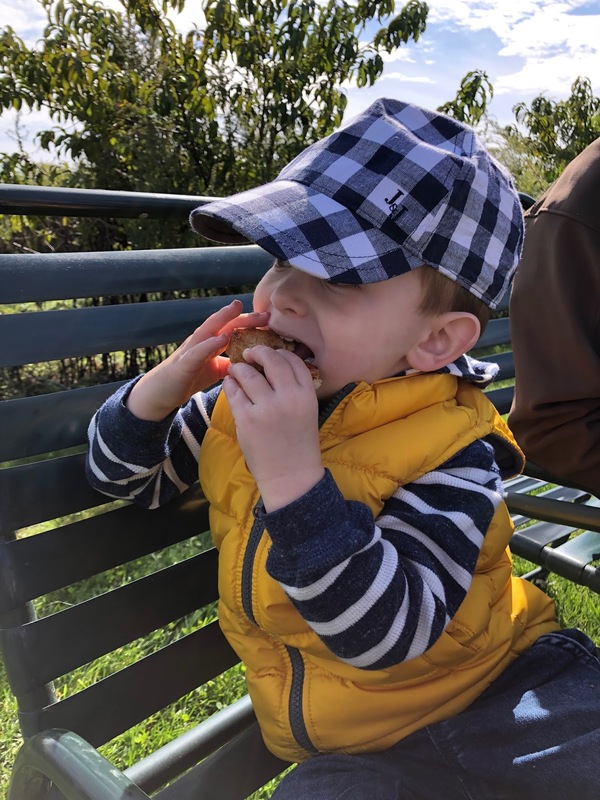 They have food trucks and barbeque available for purchase and we LOVE that Caseus Cheese Truck was there so we took advantage of it as a family today! And no fall fest is complete without a cider donut. Think we got enough donuts for the three of us?! Nope. I cannot say enough wonderful things about Hindinger Farms. 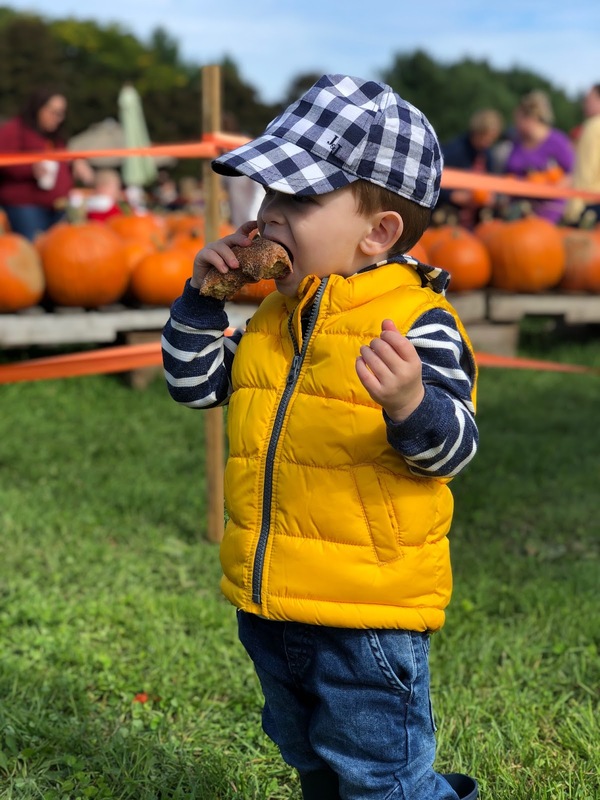 They are a wonderful family, they run an incredible farm stand year-round and this Fall Festival is simply fantastic. They go above and beyond and are so giving to the community and families come from near and far. It is free to attend and all of the activities are free, you only have to pay for your food. If you go, be sure to say hello to Mrs. Hindinger. She's almost always behind the cash register. Have you even been to Hindinger Farms before? !